Behind every wedding is a unique love story. The journey to the alter is just as important as the final result and Great Performances is proud to be a part of that journey. Here's a first-hand look at Jackie and Bill's path to their spectacular wedding at Wave Hill. How did you get engaged? What were the steps you took leading up and what did you do right after? We had talked about it here and there but I had no idea when it would actually happen. Then to celebrate my residency match back in February 2016, Bill planned a surprise trip to Martinique. For weeks, he gave me subtle hints about where we were going, and then finally, a packing list and vague itinerary the week prior. I honestly had no idea his actual intent was to propose! Bill was pretty good at throwing me off. When we arrived in Martinique, Bill had planned an EARLY (4am!!!) hike up a volcano with the intent of proposing at the summit during sunrise. But the weather had other plans, so we hiked for hours in the dark, then just as the sun started rising, a serious storm came in, bringing strong winds and sideways rain. We couldn't see a thing! Needless to say, the proposal didn't happen and we made our way back down to the base. Down below, the sun was shining and weather was beautiful, so we changed and headed to the beach. We were exhausted from the hike, but laughed off the whole thing. We ended up finding a beautiful, private beach and Bill suggested we set up the camera to take a photo. Before I had any idea what was happening, Bill got down on one knee and asked me to marry him. Obviously, I said YES!!!! As soon as we got back to NYC, I started looking up venues and pinning dress ideas. We wanted to get married as soon as possible, but I was about to start residency in Boston in July and we were going to have to be long distance for the year. So we decided we would narrow down a venue, caterer, and photographer before I left NYC and go from there. Take us through the planning process. How did you go about choosing your venue? What was most important to you when selecting a location for your big day? Choosing the venue was so difficult! I had always wanted to get married outdoors, so that automatically eliminated a lot of places in New York City. My research background came in handy here-- I started a (very type-A) spreadsheet compiling EVERY outdoor venue in the Tri-state area, with average wedding cost, distance from Manhattan, guest capacity, etc. My grandmother always loved gardens, so getting married in a botanical garden or something similar was fitting. The very first one I researched was Wave Hill. I had never been there, but the photos made it seem perfect. However, it was quite a bit over our initial budget, so we decided to keep researching. For months, I looked at numerous venues, and none of them felt quite right. So we decided to go back to square 1 and visited Wave Hill. As soon as we stepped onto the property, it was clear—this was where we wanted to be married. Beyond the stunning landscape of Wave Hill, we also loved its mission and felt good about contributing to preservation of the beautiful, historic grounds. When I learned that Great Performances was the catering company, it was a done deal! I had been in touch with Amanda DiUglio during our search when we were considering another venue they cater for and she was exceptional! How did you go about selecting any of the signature cocktails at your reception? Being from Brazil and having most of my family traveling from there, I wanted to add something that was reflective of my heritage. So naturally, Caipirinhas were the no-brainer! Bill and I also happen to love them, so it was the logical choice. What message did you want to convey to your guests with your wedding menu? Growing up on my family’s farm in Brazil, fresh farm-to-table food was always the staple and food was never wasted. Bill and I now try to maintain that philosophy as much as possible in our home. I love the quote, “Food is symbolic of love when words are inadequate.” My family and friends will tell you that one of the biggest ways I show love is through food. And how best to do that than with clean, vibrant, colorful, seasonal ingredients. 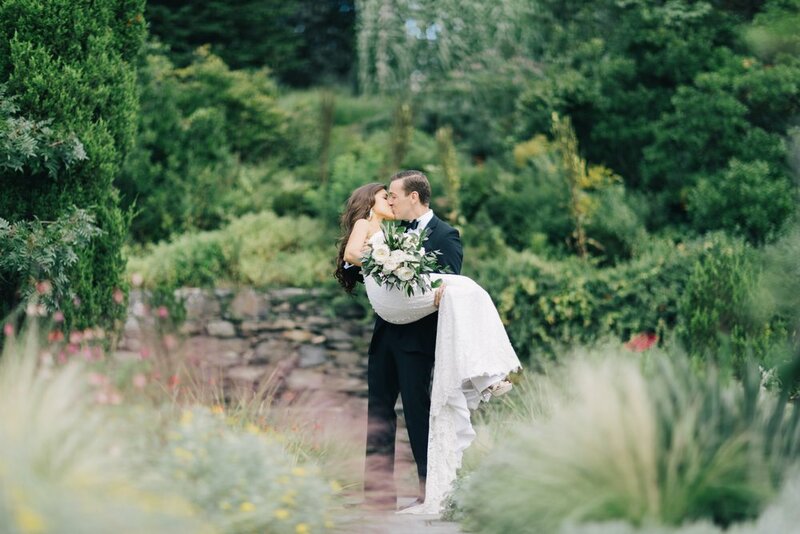 We wanted our loved ones’ tummies to be as full as their hearts on our wedding day. GP exceeded our expectations by matching our standard of fresh, beautiful food and adding an exquisite, innovative presentation that wowed us and our guests. What were some of your favorite dishes from the menu? My favorite dishes from the menu— all of them!! If I absolutely had to pick, I loved our cocktail stations, in particular, the churrascaria (which was actually Amanda’s idea). It was fun, creative, beautiful, and delicious! Our guests are still raving about it. From the passed hors d’oeuvres, the miso-glazed black bass bite with togarashi rice cake and nori was incredibly flavorful. Then both of the main dishes, the Coq au Vin with wild mushrooms, glazed carrots, and polenta was perfect, as was the hand made cavatelli with wild mushroom ragout, sweet peas, and summer truffles. I only wish I could have that whole meal again and again!